The U.S. Department of Commerce next month is expected to issue a critical ruling on one of the biggest trade cases to hit the U.S.-China energy relationship in recent years. Seven U.S. solar companies claim that the Chinese government unfairly subsidizes Chinese solar panel manufacturers to enable those companies to sell their products at below-market prices and drive U.S. competitors out of the market. The seven companies support subsidy and dumping petitions filed by SolarWorld Industries America Inc. against Chinese solar imports in October that ask the Commerce Department to levy triple-digit tariffs on solar cells and modules imported from China. This case highlights a major challenge facing U.S.-China clean energy relationships more broadly: how to handle the Chinese government’s deployment of massive resources toward developing renewable energy technologies, many of which are designed for export. Indeed, this is an issue that bedevils U.S.-China trade relations not just in clean energy, but also in other industrial and services sectors, which means that how this complaint by U.S. solar manufacturers plays out may well have much broader implications. One of the biggest challenges facing renewable energy in the United States is that traditional fossil fuels are cheaper here than they are in almost any other developed country. This is primarily due to the large supply of fossil fuels such as coal and natural gas in our nation, as well as a long history of federal government subsidies for developing those energy sources. The United States has also failed to put a carbon price on fossil fuels, so U.S. fossil-fuel prices do not include the environmental and public-health damage from greenhouse-gas pollution. Relatively low fossil-fuel prices make it particularly hard for renewable energy to compete against conventional energy in the U.S. market. Nonetheless, over the past decade U.S. companies have gotten much better at manufacturing, deploying, and operating renewable energy technologies, and as a result prices are coming down rapidly. As prices decrease renewable energy gains market share and speeds our transition toward a more sustainable energy economy. The problem is China is particularly good at making things cheaply. At the lower end of the value chain, that is primarily due to the country’s low labor costs and massive supply chains. Also advantageous are China’s lax labor, safety, health, and environmental standards. At the higher end, that is often because the Chinese government provides generous subsidies and other forms of support for high-technology research, development, and commercialization. Low-cost Chinese manufacturing plays a large role in driving prices down for a wide range of products, including renewable energy technologies. Chinese manufacturing also plays a large role in pricing some U.S. manufacturers out of business, with many of those manufacturers claiming that the “China price” is driven by Chinese government intervention rather than natural market forces. If the Chinese government is intervening in a way that breaks trade rules then that type of rule breaking should be remedied in some way. Determining whether China is playing by the rules requires taking a close look at their renewable energy policies—not only at the national level but also at the provincial and local levels. Those policies are often difficult to parse because China’s economic system is not like that of the United States. It is a nonmarket economy with a top-down, command-and-control energy planning process that is often nontransparent with even more opaque interactions between the central government in Beijing and the provincial and local governments when these policies are implemented. All this makes it very difficult to figure out whether the country is abiding by international trade rules. The United States has much to gain from cooperating with China on clean energy. As the world’s fastest- and largest-growing energy market, China is an ideal testing ground for scaling up and commercializing clean energy technologies. Combining our two energy markets increases economies of scale to bring down costs for consumers in both countries. But the China we are dealing with today is not the same China we were dealing with 10 years ago. We are accustomed to China focusing on low-end manufacturing and using their cost advantages to make U.S.-designed consumer electronics and other low-end products cheaper and faster. Now China is moving up the value chain to higher-end technology. They are aiming to compete with us in highly engineered, capital-intensive industries such as solar photovoltaic, or PV, systems, where the United States has long enjoyed a comparative advantage. In short, instead of serving as the low-cost workshop for U.S. companies, China is aiming to capture the parts of the product and services value chain that we are used to dominating. The United States should not shrink from that challenge. Our firms are generating the best high-end technologies in the world, and we have a skilled workforce that is hard to beat. A rising China is not a reason for us to close off our clean energy markets and forfeit the benefits we can get from bilateral trade and other forms of collaboration. This relationship is only a win-win, however, if we compete with the Chinese on a level playing field, which is proving to be the biggest challenge. Ensuring that the Chinese play by the rules will require more policy coordination on these types of bilateral trade disputes here in the United States. The Obama administration’s new trade enforcement initiative is a critical step in that direction. But it is only a first step. This issue brief will give an overview of the current solar PV trade dispute to highlight the larger challenges we face. China’s energy economy is a massive command-and-control juggernaut, and our energy companies are often forced to choose between letting a variety of trade problems slide versus squaring off against that system on their own. Ensuring the U.S. government recognizes and addresses that imbalance at the federal level vis-à-vis China will be critical for keeping the U.S.-China clean energy partnership moving in a positive direction. The United States will also have to do a better job coordinating trade enforcement at the international level because multilateral pressure is increasingly needed to make the Chinese government adhere to global norms and rules. Since China’s trade policies are also harming clean energy exporters in many other countries—particularly in Europe— the United States should have plenty of partners to work with. The current trade case focuses on crystalline silicon photovoltaic cells and modules, which convert sunlight into electrical energy. The demand for these PV solar cells and modules is driven by the demand for solar panel installations. Solar technology has expanded rapidly in recent years due to the increasing interest in low-emissions technology and the declining costs of solar cells. Since it is a newer technology, however, it is still generally more expensive to deploy than natural gas or coal, at least in the short term. Most countries already have extensive infrastructure to support coal, but solar infrastructure is still underdeveloped so solar prices have to include infrastructure development and capital costs. Due to those additional costs, the price differential for solar panels over the past decade has been driven primarily by government subsidies to boost deployment of solar energy. In Europe many of those subsidies are in the form of a “feed-in tariff,” which requires utilities to purchase solar energy at prices that are higher than what the utility is paying for conventional fossil energy. Germany launched the first major nationwide solar feed-in tariff in 2004, and other European countries followed suit. In contrast the United States has tended to pass renewable electricity standards, which set an overall goal for utilities in a certain state or city to produce a certain amount of electricity using renewable sources. Twenty-nine U.S. states now have these policies. Before 2004 global solar panel demand was relatively low, and there were no strong incentives to produce solar equipment for export. Starting in 2004, however, global demand increased exponentially, particularly in Europe, which caught the attention of equipment manufacturers worldwide. Chinese firms in particular saw a new export opportunity and started manufacturing solar panels for Europe and other overseas markets. As they have in many other sectors, Chinese enterprises took over the global solar manufacturing market by competing on price. The “China price” is the focus of the current trade case. The solar PV petition claims that the Chinese government unfairly subsidizes Chinese solar panel manufacturers by providing land, electricity, material inputs, and financing at below-market rates, as well as direct financial support and other preferential policies. The petition says those subsidies are designed to artificially suppress Chinese manufacturing costs and drive foreign competitors out of the market. China certainly has a host of policies designed to spur indigenous innovation across a wide range of clean energy technologies including solar. At the national level Chinese leaders define clean energy as their “historic opportunity” to finally gain a dominant market position in a critical technology sector. Green energy is one of seven strategic industries that Beijing strongly supports with state financial resources and other preferential policies such as tax breaks. Since Beijing prioritizes clean energy development, provincial and local governments have a strong incentive to develop their own support policies. Some local officials simply implement national directives such as the Ministry of Finance directives calling on local financial bureaus to raise and distribute green energy development funds. Other local governments see clean energy as a prime growth opportunity and go well beyond national policy requirements in an attempt to turn their provinces into clean energy manufacturing hubs. Case in point: Jiangsu Province has particularly aggressive solar development policies. Jiangsu’s 2009 three-year solar PV development plan set ambitious targets for solar-module production and called on local officials to cultivate name-brand products and internationally competitive enterprises by providing state assistance for product development and supply-chain verticalization. The result is a province responsible for two-thirds of China’s total solar PV equipment production in 2010—more than 90 percent of those products were exported to overseas markets. Subsidy programs are not necessarily anticompetitive. Green energy is an emerging technology sector, and policy assistance is often required to help new technologies compete with existing market alternatives—especially when the existing alternatives such as coal already receive explicit and implicit public subsidies. We have similar green energy programs here in the United States. What the U.S. trade petition claims, however, is that China’s subsidies are designed not just to support infant industries but also to undercut competitors so that China’s domestic enterprises can take over a larger share of the global market. The solar PV trade petition claims that the subsidies provided to Chinese manufacturers are “countervailable,” which means they artificially suppress Chinese manufacturing costs to enable Chinese companies to sell their products at nonmarket prices that U.S. companies cannot match. If the Chinese government is indeed using subsidies for that purpose then it is a market- distorting tactic that violates a host of trade rules—not only World Trade Organization subsidy rules but also domestic trade legislation here in the United States. The solar petitions also include allegations that China is “dumping” in the U.S. market. “Dumping” is the practice of selling goods in the United States at less than home market price or cost of production. Dumping is also prohibited by the WTO agreements and by U.S. law, if it results in material injury to a competing U.S. industry. The Chinese dispute those allegations. 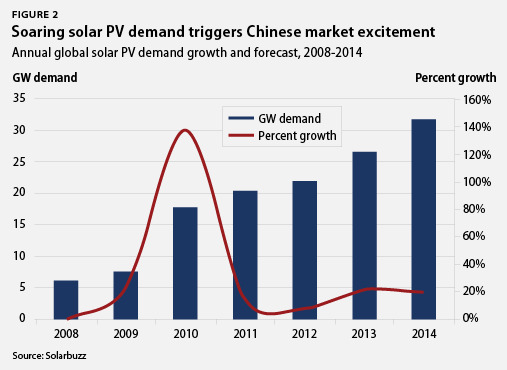 When interviewed for this issue brief in Beijing recently, Chinese analysts all claimed China’s low solar PV prices are due to a combination of China’s comparative advantages in manufacturing and, particularly over the past few years, excess capacity and market-induced inventory clearing. 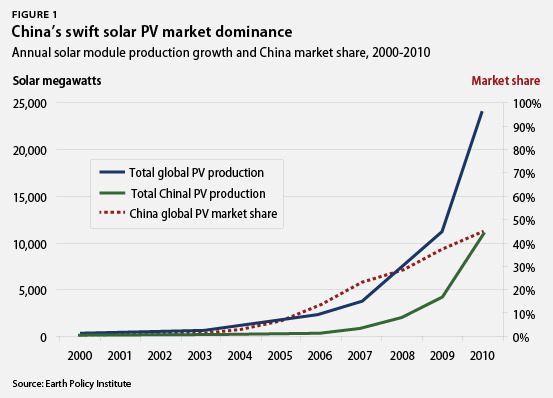 According to the Chinese manufacturers, soaring demand growth between 2008 and 2010 (see Figure 2 below) made solar manufacturing look like a golden opportunity, and as a result hundreds of private Chinese enterprises dove into the sector throughout 2010 and early 2011. Even Chinese leather companies dove into the market by opening up solar manufacturing subsidiaries. Chinese energy analysts call these manufacturers “bantu chujia,” which roughly translates to “halfway monk,” or someone who takes up something new without committing to it completely and without acquiring the necessary expertise. Then the pace of global market growth slowed significantly—from almost 140 percent growth in 2010 to around 17 percent in 2011. Chinese firms claim the multitude of new entrants flooded the market with excess capacity, and Chinese manufacturers were forced to price solar modules below market value to clear inventories, thus triggering a steep price drop that damaged profits not only in the United States but also in China. Unfortunately, parsing out how much of the China price is due to market forces versus anticompetitive government subsidies is extremely difficult. The reason: China’s subsidy programs are often nontransparent, particularly at the provincial and local levels. It is very common, for example, for local officials to provide land, electricity, and other resources at below-market rates to attract economic development (and the associated tax revenue) even when the central government does not support those tactics. Loan subsidization is also common. China’s tier-one manufacturers claim they are paying market interest rates for their massive and controversial China Development Bank loan guarantees, but some local governments reportedly reimburse those companies for most of their interest payments, thus reducing the effective interest rate to nearly zero (or, depending on inflation, possibly even below zero). In many cases local governments provide these supportive measures on a case-by-case basis instead of via clear development policies that apply to all firms across the board. These measures can make China’s local level clean energy support programs very difficult to measure. China’s national leaders often struggle among themselves to get an accurate picture of what their local level officials are doing. Indeed, national level officials complain that local level economic growth statistics are often fabricated. When even Beijing has a hard time tracking local activity, it is almost impossible for foreign observers to do so in a systematic fashion, and that can create confusion here in the United States. The Department of Commerce is investigating this solar PV case and will soon announce whether they have found sufficient evidence to levy trade remedies. Commerce investigators are tracing the financial and policy support the Chinese government provides to Chinese solar manufacturers, and the U.S. International Trade Commission will try to determine to what degree that support decreases Chinese manufacturing prices and damages U.S. manufacturers. The Department of Commerce is expected to issue a preliminary subsidy determination in early March and a preliminary antidumping determination several weeks later. If the ongoing investigations find Chinese trade violations, then that preliminary announcement will likely include a plan to levy tariffs against Chinese imports. It is possible that once the Chinese government realizes tariffs are imminent they will try to negotiate a settlement—they may offer to halt the contested subsidies or take other action to get SolarWorld to drop the case. That is how China responded to the September 2010 WTO complaint by the United Steelworkers about Chinese government subsidies to wind equipment manufacturers. Some U.S. solar companies—particularly the companies that already have purchasing agreements with Chinese solar manufacturers—are hoping that this case will end in a negotiated settlement instead of import tariffs. No matter how this particular dispute ends, however, there is a much bigger underlying issue here that we must not overlook. Over the past three decades, China’s role in the global economy has primarily been as a low-value-added manufacturer. Now the Chinese want to move up the value chain to increase profit margins and play a more dominant role in higher-end global technology markets. Specifically, they want to supply the United States with higher-value-added technologies, particularly clean energy technologies. And the Chinese government is dedicating a huge amount of state resources to help their enterprises achieve that goal. China’s technology ambitions can be a good thing for the United States, particularly in renewable energy. Our two countries are the world’s biggest energy consumers, and open competition between our massive energy markets can fuel innovation, bring clean energy prices down, and speed both of our country’s transitions toward a more sustainable energy economy. But here’s the rub. China is a nonmarket economy with a less-than-transparent energy planning process. This makes it very hard to identify when the Chinese cross the line from market competition (which we want to encourage) to anticompetitive behavior (which we should fight back against). We already know that the Chinese government sometimes tries to skirt trade rules. When China joined the World Trade Organization in 2001, the government pledged to submit required reports on specific national and regional subsidy programs every two years, but it has not abided by that pledge. Over the past 10 years it has only issued two reports. The first, in April 2006, covered some subsidies from 2001 to 2004, and that report was incomplete because it only included national subsidies not subnational programs. The Chinese government submitted a second notification in October 2011, but again did not include subnational programs—even though China has clear obligations to do so. Because China has not submitted these reports as promised, it makes it more difficult for U.S. companies to examine Chinese policy programs and determine whether they are rule-abiding or anticompetitive. Furthermore, since government transparency is a major problem in China across the board, even when U.S. companies are willing to spend their own resources to collect that data, it is extremely hard to do. This gives China a lot of maneuvering room to enact programs that erode U.S. competitiveness. Clearly the Chinese government needs to do more to comply with these trade rules, and the U.S. government—and the global community as a whole—needs to do more to enforce that compliance. We have two dispute-resolution systems specifically designed to handle company complaints about apparently anticompetitive trade practices—the antidumping and countervailing duty mechanisms here in the United States and the WTO process at the international level. But filing a formal complaint is costly in both cases. Some U.S. manufacturers may not be willing to invest in expensive legal fees, particularly if—due to the transparency issue—they themselves are not certain whether the China price is market-based or government-induced. For those companies who are actually doing business directly with China, retaliation is another concern. Officials at U.S. Office of the Trade Representative, or USTR, frequently complain that although U.S. companies share information about Chinese rule breaking privately, most are unwilling to file formal complaints because they suspect the Chinese will retaliate with punitive market access reductions. In the current dispute SolarWorld Industries America Inc., the domestic unit of the German company SolarWorld AG, was the only one of the seven solar comapnies willing to state its support for the case publicly. The other six companies remained anonymous due to fears that China would retaliate. Retaliation can also spread beyond the actual petitioners to harm the U.S. economy more broadly. In the current case, for example, trade remedies that spark Chinese retaliation could also harm U.S. companies selling clean technology inputs to China. Chinese manufacturers have already targeted upstream solar suppliers by calling on their own Commerce Ministry to initiate an investigation into U.S. subsidies and dumping for polysilicon exports to China. China could retaliate by blocking market access as well. In private conversations many U.S.-based polysilicon and solar manufacturing equipment suppliers say that in the current trade case, retaliatory market access limitations are a major concern. Many U.S. solar industry suppliers fear that if the Commerce Department levies tariffs against Chinese manufacturers, then those manufacturers will immediately start buying upstream products from other countries instead of from the United States. Some Chinese companies are apparently already inserting escape clauses into their purchasing contracts to pave the way for that switch. If U.S. companies do face retaliatory measures from the Chinese, that would be a trade violation, and they can certainly file another round of formal complaints. But retaliation can be difficult to prove because it can be difficult to prove why a Chinese customer switched from a U.S. supplier to a European one. What’s more, successive rounds of trade disputes over switching customers would be a massive economic drain on U.S. companies. The flip side of retaliation is coercion—in the form of required technology transfer to enter the Chinese marketplace and access the country’s cheap labor, its booming domestic market, and the many government subsidy programs that are available to companies. Technology transfer is frequently part of global trade deals, but the Chinese government often carries it too far by blatantly pressuring foreign companies to share proprietary engineering information for the types of high-end technology products Chinese firms are struggling to develop themselves. This can lead to intellectual property theft, which again harms U.S. companies and erodes U.S. competitiveness. To move forward the U.S. government will have to do a better job at dealing with these threats to U.S. companies operating in China or exporting there. We need to understand and then act upon the reality that the Chinese economy does not operate like ours. The U.S. economy is a decentralized, market-based system without top-down economic planning. Chinese leaders, in contrast, run their economy with top-down development plans that put a lot of government support behind critical industries such as clean energy. Those top-down directives then metastasize at the provincial and local levels into myriad programs and policies that are all but impossible to discern. That difference can sometimes mean that when problems arise, individual U.S. companies and industries are forced to choose between letting apparent rule breaking slide versus squaring off against China’s massive administrative state at the national, provincial, and local level. Both options erode U.S. company profits, but in an era where China is a global economic powerhouse, many U.S. companies decide that the first strategy—tacit accommodation—is likely to result in the least damage. Over time tacit accommodation can erode U.S. competitiveness. To avoid that we need to find ways to lower the costs of monitoring this bilateral relationship to make sure Chinese enterprises and officials play by the rules and compete with U.S. companies on an even playing field. Doing so will require a shift from the current strategy that places our primary enforcement efforts on the backs of individual U.S. companies, some of which—like many renewable energy companies—are in emerging industries that lack the political leverage to do battle with the Chinese. The best way to address this problem is to improve trade policy coordination at home. Beijing is very adept at “divide-and-conquer” tactics. In the foreign policy realm, Chinese leaders are well aware that if they can maneuver other countries to deal with them bilaterally, China will have more negotiating leverage than it would against a united multilateral group. China wants to use the same tactics against U.S. companies— maneuvering them to square off one by one against the massive Chinese state. The U.S. government needs to do a better job making sure that this approach is not effective. In 2010 the USTR took a critical step in that direction with a year-long program to monitor Chinese government support for Chinese companies competing against the United States in clean energy. USTR also surveyed China’s subsidy programs across the board, uncovering around 200 different programs that violated WTO rules. USTR notified the Chinese government of these alleged violations and also submitted a list of Chinese subsidies to the WTO. That step does not automatically trigger a WTO investigation, but it does require China to provide more information about the USTR- contested subsidy programs. It also makes the USTR findings available to other countries, which can help increase multilateral pressure against this type of rule breaking. If the Chinese government fails to respond to USTR notification by providing detailed information on their subsidy programs, then USTR may escalate by submitting a complaint to the WTO Subsidies Committee. These information-gathering and notification procedures call international and domestic political attention to Chinese rule breaking. They also lay the groundwork for the United States to file additional trade complaints and levy additional tariffs against Chinese imports, which should give the Chinese government stronger incentives to comply with the rules. It is important to note that the USTR subsidy survey did not require specific U.S. companies to file formal petitions and act as intermediaries, a role that can often turn them into sacrificial lambs. Instead the Obama administration kicked off this investigation proactively when it launched the National Export Initiative in early 2010. That initiative ordered USTR and the Commerce Department to pay closer attention to foreign government subsidies that erode U.S. competitiveness, particularly vis-à-vis Chinese manufacturers. Then there is the new Trade Enforcement Unit announced by President Barack Obama in his recent State of the Union speech. The president said the new unit will bring together key U.S. trade officials from the departments of the Treasury, Commerce, Energy, and USTR (under Michael Froman, deputy national security adviser for International Economic Affairs) to better coordinate U.S. trade actions against China. That unit will reportedly also consider asking the Commerce Department to initiate countervailing duty and antidumping cases itself on behalf of U.S. industries rather than waiting for companies to file individual petitions. In theory this approach should go a long way toward balancing the interests of U.S. companies against Chinese government involvement in these disputes, thereby eliminating the burden on U.S. companies for initiating these actions and reducing the possibility of retaliation by the Chinese against individual U.S. companies. If this unit also directs more federal government time and resources toward monitoring Chinese government behavior—flagging apparent trade violations and raising formal complaints with the WTO—then this approach may also enable the United States to better enforce Chinese compliance with basic WTO rules. We also need to make sure we are investing in the foundations of innovation here in the United States to give our companies the policy environment they need to remain competitive against a rising China. It is inevitable that there will be some global economic reshuffling as China moves up the economic ladder, but we can gain a lot of benefits from that process if handled well. China’s growing domestic market, for example, can be a major new source of consumers for U.S. products, but we have to make sure that we do not cede critical American jobs to the Chinese—in solar manufacturing as in other U.S. industries—just because we were lax on the policy side. China’s focus on renewable energy and high technology is here to stay. That can be a great thing for the United States. Chinese competition can give U.S. companies stronger incentives for innovation and can help bring down renewable energy prices to better compete with traditional fossil fuels. Combining our two markets can also increase demand for U.S. clean energy products and provide exactly the types of higher-paying jobs that we need to restore our economy to sustainable, broad-based economic growth. This relationship is only a win-win, however, if our companies have a level playing field, and more work is needed to achieve that goal. The Obama administration’s new trade enforcement initiative is a great start in the right direction. Other steps may be identified once the new Trade Enforcement Unit is up and running—steps both bilateral and international in scope that can help the United States and China better manage this critical bilateral trade relationship for the benefit of the global economy. Melanie Hart is a Policy Analyst on China Energy and Climate Policy at the Center for American Progress.
.	“Guo jia zhong chang qi ke xue he ji shu fa zhan gui hua gang yao (2006-2020)” (Guidelines for the National Medium- and Long- Term Science and Technology Development Program, 2006-2020), PRC State Council, February 2006, available at http://www.gov. cn/jrzg/2006-02/09/content_183787.htm.
.	“Jiangsu sheng guang fu fa dian tui jin yi jian” (Jiangsu Province Opinions for Advancing Solar PV Generation), Jiangsu Sheng Fagaiwei (Jiangsu Provincial Development and Reform Commission), June 30, 2009, available at http://www.carcu.org/html/ zhengcefagui/20090702/2974.html.
.	“Guang fu chan ye zai wai shou zhi yu ren qi neng rang han dong leng le yang guang?” (Solar PV Industry Suffering Restraints Abroad: How to Shine Light on the Cold Winter? ), Zhongguo Huanjing Bao (China Environment Report), December 31, 2011, avail- able at http://ditan360.com/NengYuan/Info-98515.html.
.	Xu Meng, “Guo nei guang fu chan ye cheng xian jing pen ren ren zheng gan tai yang neng sheng yan” (“Domestic Solar PV Industry Becomes a Gold Rush: Everyone Rushing to Join Solar Energy Feast”), Jiefang Ribao (Liberation Daily), February 23, 2011, available at http://www.chinanews.com/ny/2011/02-23/2861583.shtml.